Jess and Alex nearly didn’t book a photographer, which as far as we’re concerned would have been an absolute travesty! 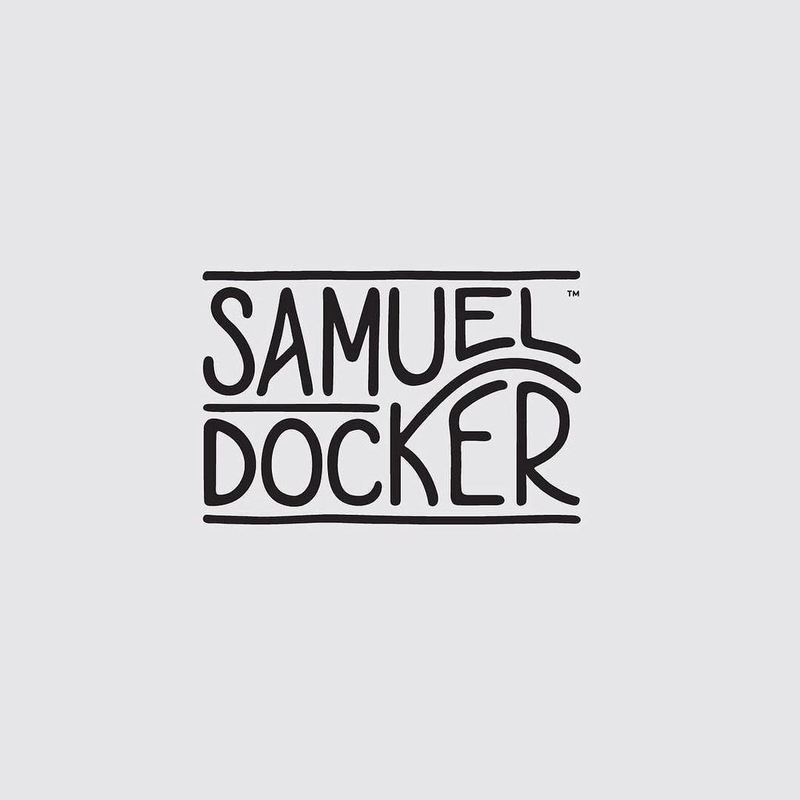 They clearly hadn’t discovered the wonderful world of reportage photography, but by an amazing twist of fate (otherwise known as google) they stumbled across the right man – Mr Samuel Docker. 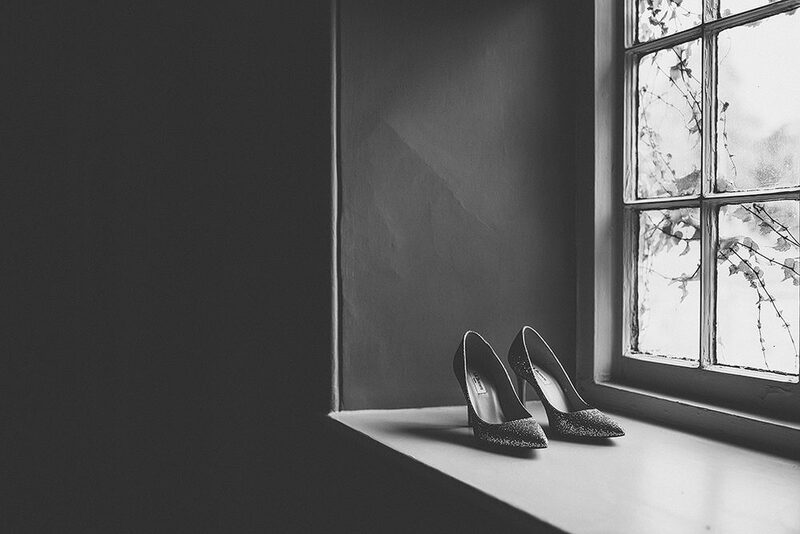 Who happened to be a Regular shooting weddings at their venue Stone Barn, the lucky LUCKY pair. 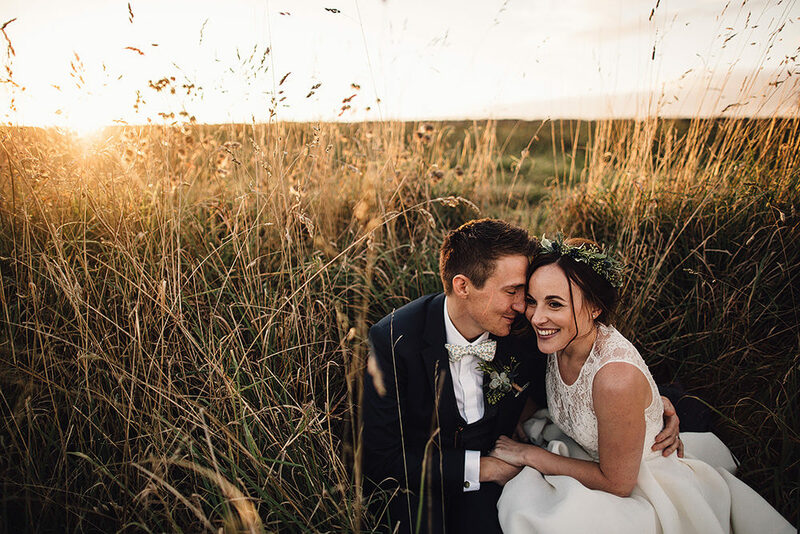 You’ll know if you read regularly that we love Sam, his images speak for themselves and he’s just such a positive, fun person to have with you on your wedding day. And now Jess and Alex have the most wonderful set of images to relive their day by. Jesus Peiro bought from The Bridal Boutique Warwickshire in Henley-in-Arden. The first time I went dress shopping was pretty surreal (as I’m sure the majority of brides feel) I didn’t feel comfortable in any dresses, not one for normally dressing up, preferring to be in jeans and trainers. The dresses were all beautiful but I just felt and looked awkward. 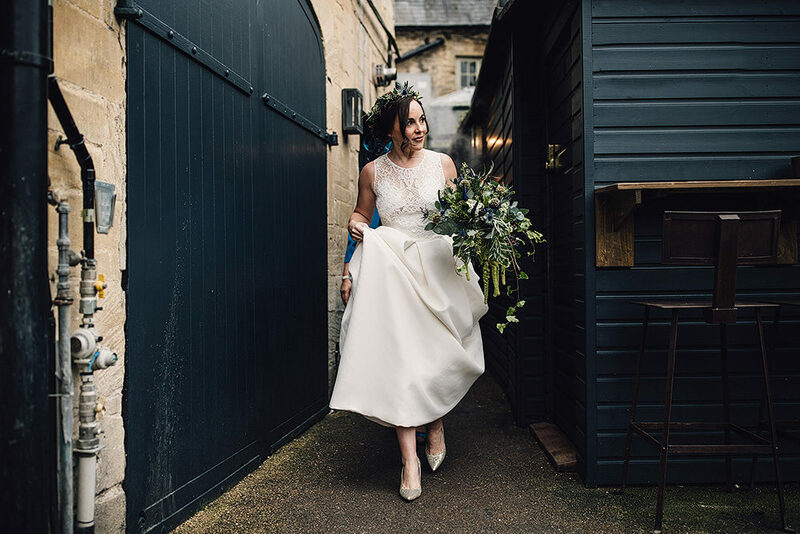 So I left it for a few months to get used to the idea of being a bride and then booked an appointment at The Bridal Boutique in Henley-in-Arden. Madi and her team of girls were amazing, they showed me and my crew (Mum, sister and best friend) loads of dresses and explained what was in my budget. My best friend and I had spotted a dress in the window as soon as we walked in but Madi explained this was a little out if budget; I tried on a load of dresses but this one kept creeping into my eyeline…in the end Mum said to try it on just to see. Well of course that was the one! Blow the budget I guess! I felt really comfortable straight away and it pretty much fitted too which helped to get me to picture it on the day. The fact it had pockets was a massive selling point and I loved the weight of the skirt part. Jess’ engagement ring and both wedding rings were from Mitchel & Co. in the Birmingham Jewellery Quarter. Amazing floral crown by Jodie Smith of Mitchel & Co.. I knew I didn’t want a veil on my wedding day but wanted something in my hair so toyed with a few ideas but kept coming back to images of floral crowns. I mentioned it to Jodie and she said it would be fabulous so I just let us do her thing! I literally just said I like thistles and succulents and she made this perfect crown. It was exactly what I wanted and Alex loved it too. It held up right through the night, even with loads of jumping about and dancing with a silent disco head set on! We run our own catering company called The Little Pickle so the food was a very important aspect for us. 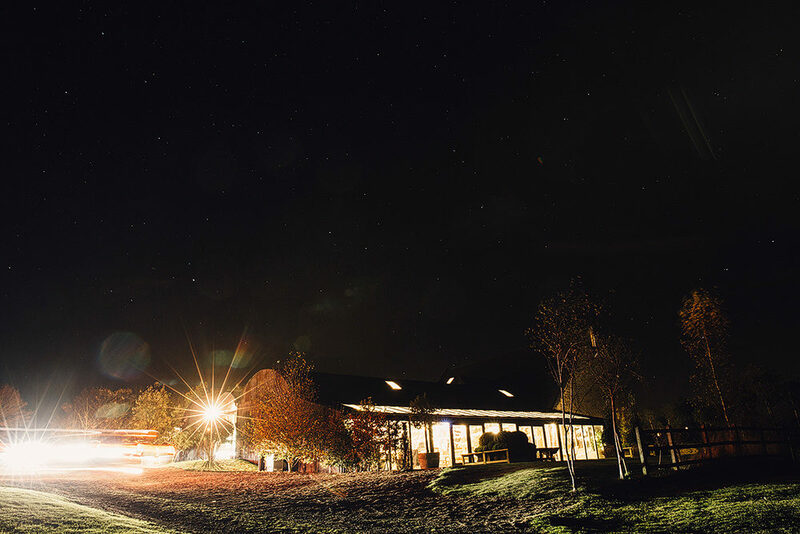 We had looked at Stone Barn online and read reviews about their food, we had pretty much made up our mind before we even visited the venue but as soon as we walked in Alex said, this is it! 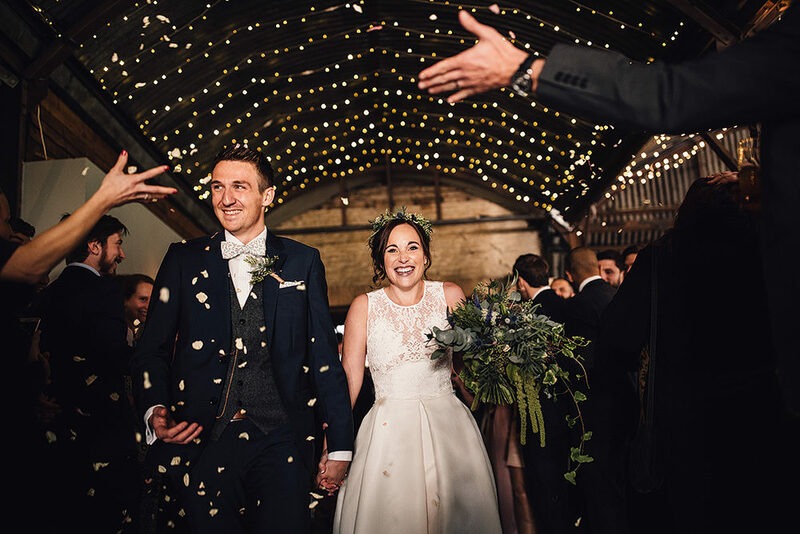 We viewed Cripps Barn as well but for us Stone Barn had more of an Autumn/Winter feel and we just loved the smell of the wood burning and the light that you get in the barn. Clayton and Jason co-ordinated the day and were absolutely amazing; our guests are still telling us how awesome the food was! 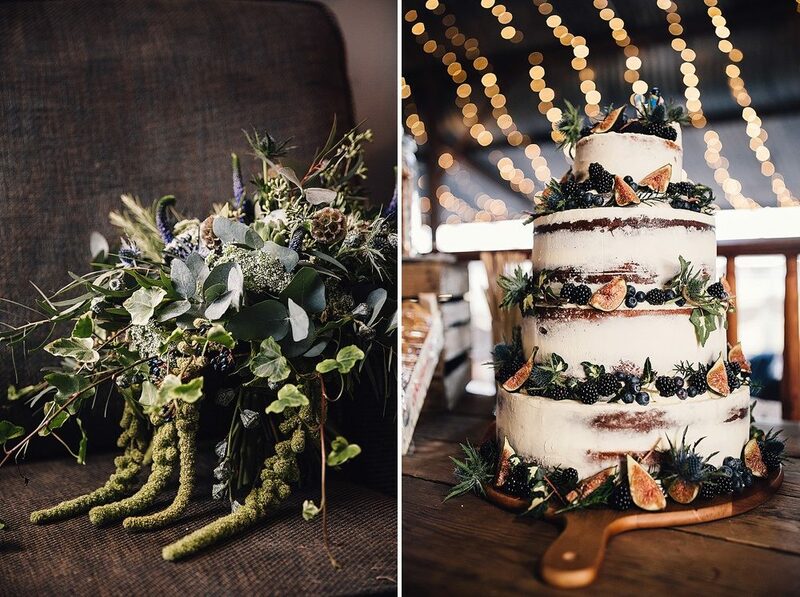 The venue is so beautiful even when not set up for a wedding so the vibe is really natural and easy going which is what we wanted, nice and relaxed. It also means you don’t have to do too much in the way of decorating! 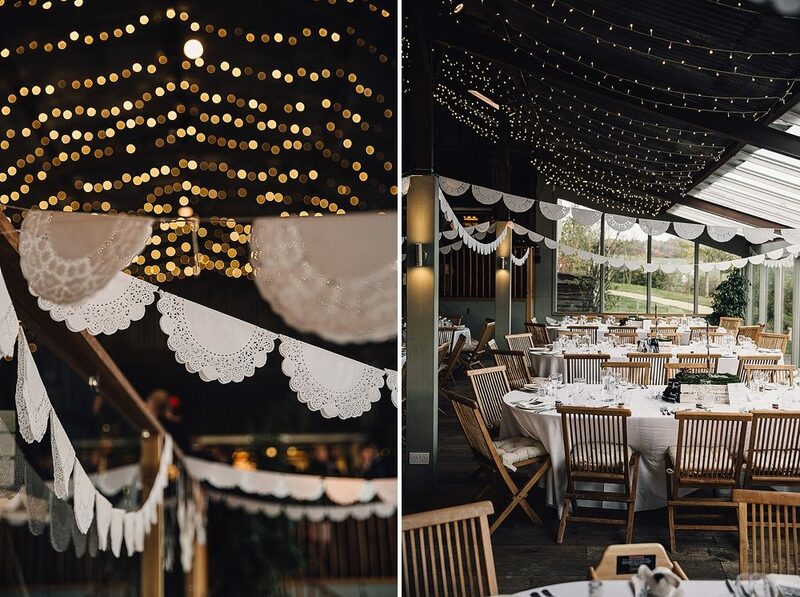 We made our own doily bunting which we hung over the dining area then a few of our own signs, photo booth etc to put our own touch on it. 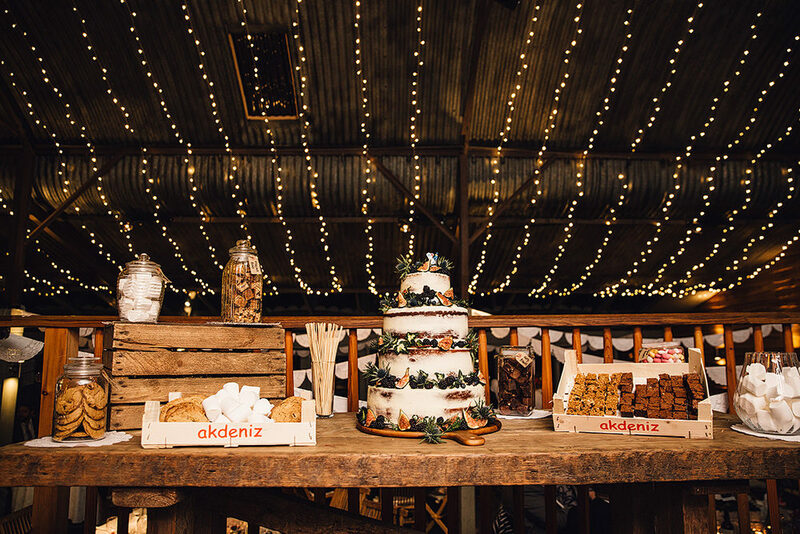 Everyone said we were mad to make our own cake but we knew we could create exactly what we wanted for a fraction of the price so we set about doing it the day before the wedding – not recommended if you haven’t made a few cakes before! We had 3 different flavours; vanilla, apple & cinnamon and lemon & poppy seed. We decided on a naked cake as neither of us like thick sugary icing and our toppers were little lego snowboarders as we met while in the French Alps. In our business we also make our own pickles and preserves so it was easy for us to make our own miniature favours – pumpkin piccalilli for the men and quince jelly for the women. Jess’ sister and best friend were the bridesmaids and both have very similar colouring. Half way through planning we found out that one of them was pregnant so we had to address the choice of dress! The girls were given free reign and agreed on navy with some glitz on the shoulders which looked gorgeous, very hollywood glam! Alex wanted a special suit that he would wear again, an investment piece. So he chose Hugo Boss in a deep blue which looked great with the bridesmaids and the colours in the flowers. 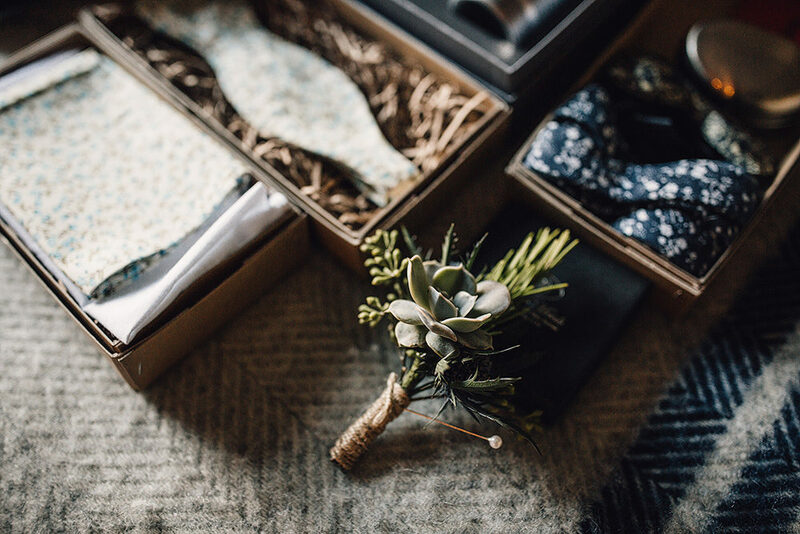 The bow tie, ties and pocket squares were all from Mrs Bow Tie. The groomsmen were pretty easy to please and chose off the rack navy suits to match Alex’s. We made our own Save The Dates but then got a download invite from Etsy.com which we personalised to have a mini drawing of us including Jess’ Rayban glasses; we then put the figurines on to our menus etc which we made ourselves. Jess went to school with Christian and had wanted him at her wedding all along. When Alex met him and saw what he could do it was a no-brainer! 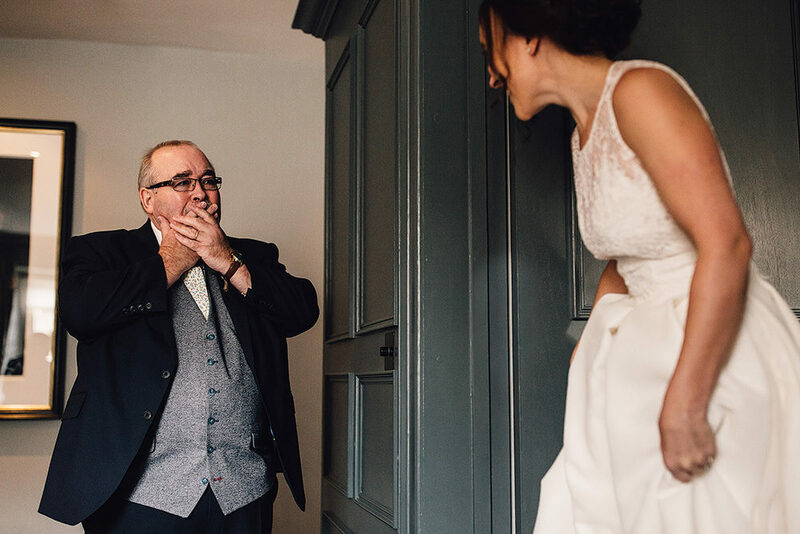 He kept our guests entertained while we had our family photos, he was brilliant, everyone loved it and we were so pleased we had chosen to have him perform. In the evening we had a live band called The C90s. Alex found them after trawling through loads of wedding bands. They were awesome, really got the crowd going and made doing the first dance a lot less nerve wracking! 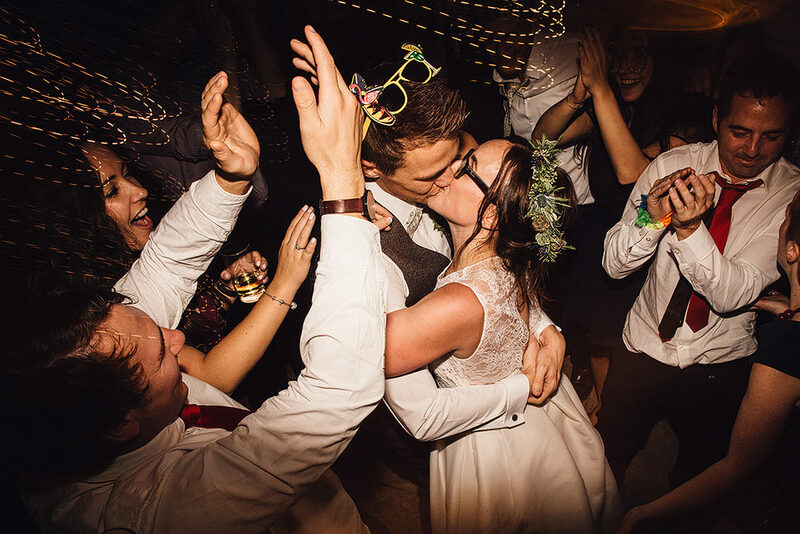 Then we had a Silent Disco to finish off which a lot of guests have said was the highlight, it was so much fun and everyone got involved, we loved it and Sam got some wicked photos of everyone singing and dancing to different music genres at the same time – it was priceless! Suzie and her car come as a pair and they are both incredible! 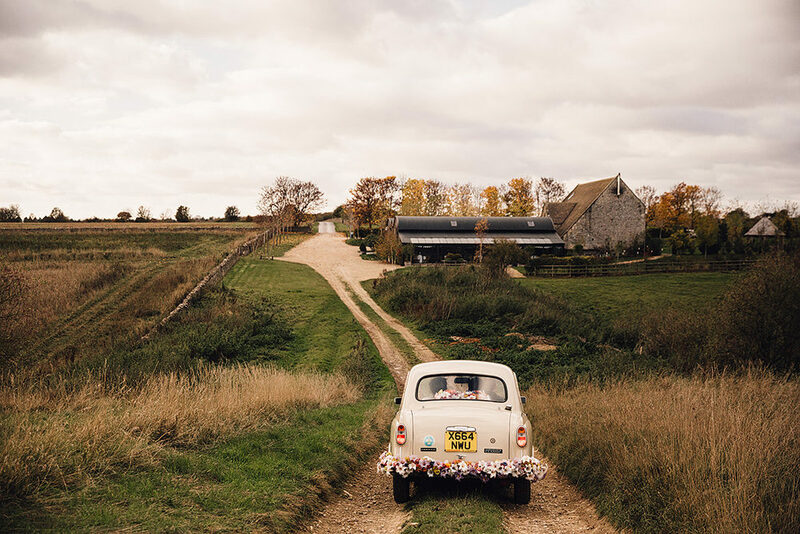 Alex wanted to book a special vehicle for me to travel from The Wheatsheaf Inn – where we we staying the night before and the night of the wedding, to get to Stone Barn. 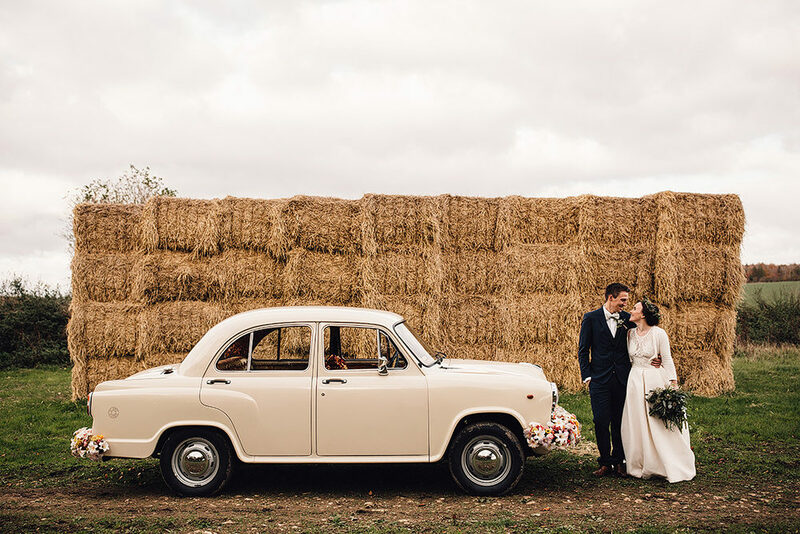 He found Suzie when searching unusual wedding cars in the Cotswolds. She arrived quickly and cheerily and made me and my parents who travelled in the car with me, so relaxed and at ease. The car is simply beautiful and all our guests loved it, it really added to the photos and Suzie was happy for people to have photos sat inside if they wanted. We loved it! What can we say about the lovely Sam…We almost didn’t have a photographer at all. Neither of us like having our photo taken and we were really worried about awkward cheesy photo shoots with family members freezing in the November cold while they got ushered into different arrangements. Then a good friend mentioned a type of photography that is more relaxed and ‘hidden’ so that you barely know the photographer is there (reportage) and we thought that might be the way to go. 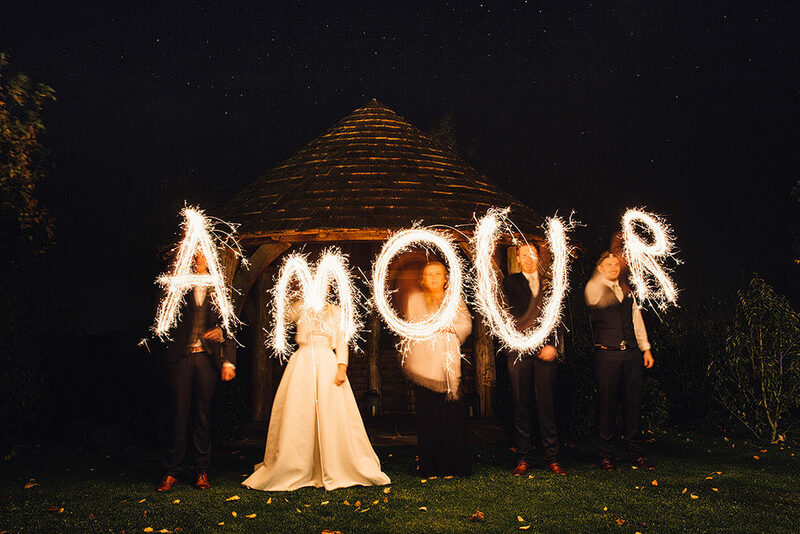 So we looked at several weddings which had happened at Stone Barn and came across some of Sam’s work, we were sold straight away. Sam insisted on a chat before booking him so that we could get to know a bit about him and how he works. As soon as we chatted to him we knew he was the one for us! Booking him was so easy and organising the kind of photos we wanted was even easier. We were obviously a little nervous on the day of the wedding but Sam really made us feel so relaxed and our families and friends loved him too. We don’t know how he does it but he managed to be everywhere we weren’t and were, catching photos of stuff we didn’t even see happening which makes for some entertaining watching!! He was friendly, efficient, professional and lovely…we could go on but we don’t want his head to get too big. It doesn’t end there either; Sam sent us a little taster within a week of the wedding which was awesome and then when we received the whole sch-bang we were overwhelmed with how good the photos were. Breathtaking. As you can see! 1. Have the wedding YOU guys want, not what your families expect or want. 2. Think carefully about what’s most important to you and where the budget can be stretched or saved. We made a lot of stuff ourselves so we could afford the venue, photographer and entertainment we wanted. 3. Doing stuff together as a couple is really important and rewarding, and have fun with it! It’s meant to be the best day of your life after all! 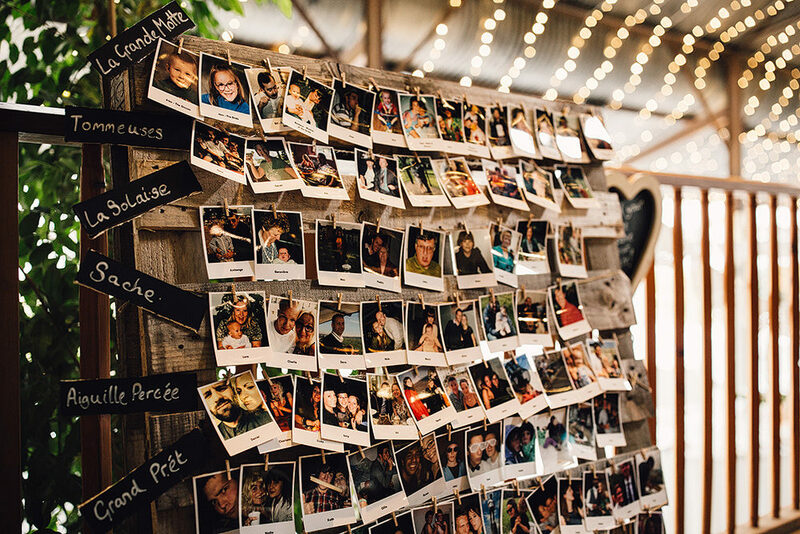 I absolutely LOVE the photo under the stars – lovely images for what looks to be a lovely wedding! Please forward any ideas on a fall wedding! Thx!